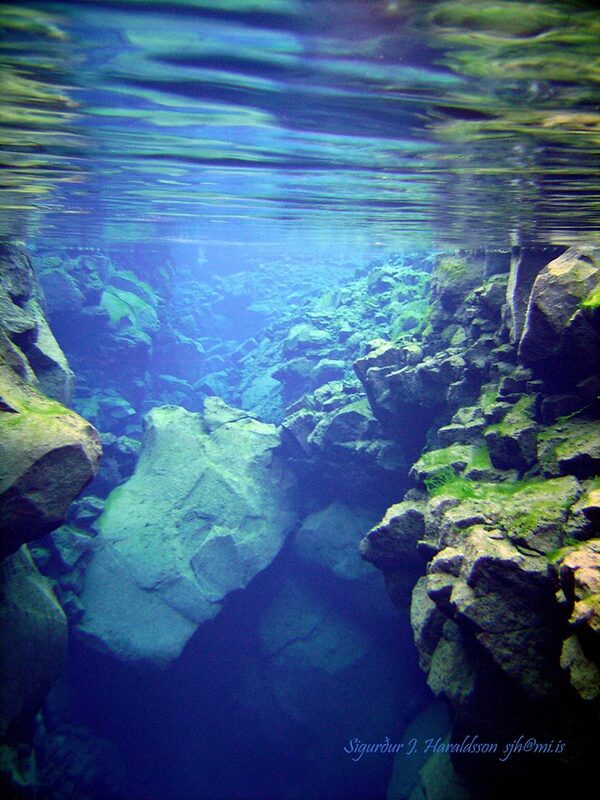 Silfra is a fissure in Thingvellir national park. 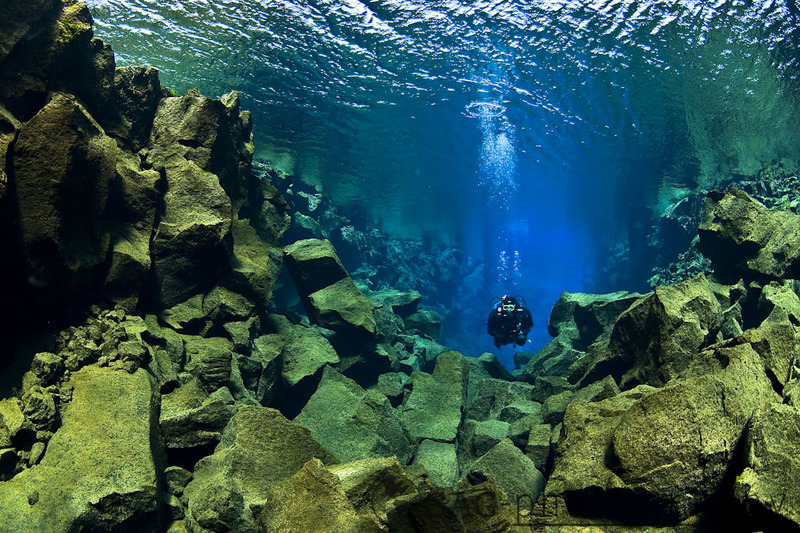 It is famous for its amazing visibility and is a must dive for all divers who come to Iceland. The water in it seeps through the surrounding lava fields which filters the water and renters it pristine clear. Thingvellir is a rift valley made by the continetal drift of the Eurasian and North-American plate drifitng apart. This has made the fissures in Thingvellir including Silfra. The water in Silfra is 3 degrees all year around. Dry suit certificate is required to dive in the national park. Bjarnagjá is a fissure with brackish water in it and is close to the sea. It is a popular dive site when the weather is to bad for an ocean dive. 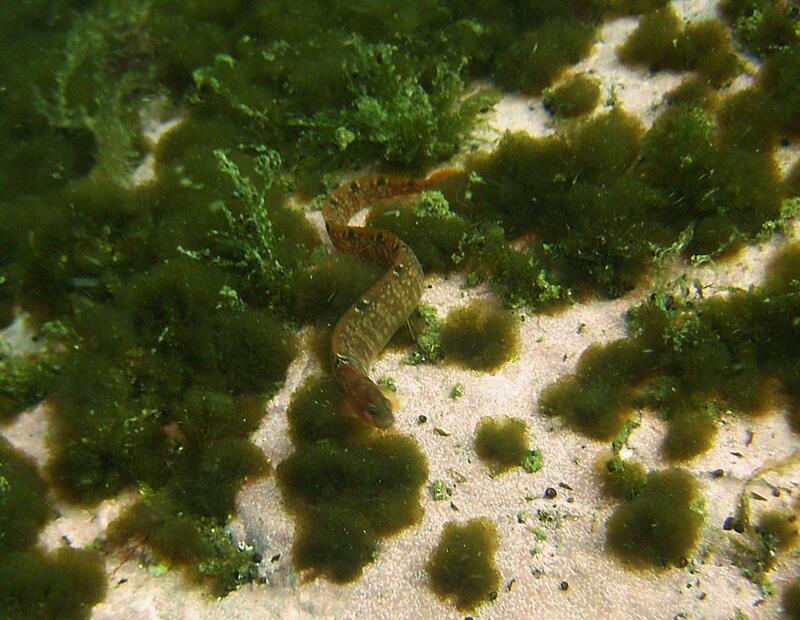 The fissure has many amphipods and sticklebacks in it as well as craps can be seen there. On occasions fishes find their way into the fissure. Kleifarvatn is a lake close to Reykjvík and it is famous for its underwater geothermal area. There you can dive over active hot-springs that spew out bubbles and mineral rich water that leaves a taste and color in the water. This is an easy dive for all level of divers. The lake also has deep dive sites that have strange rock formations and fissures as the lake sits between two volcanoes and on a fault line. Davidsgjá is another fissure in Thingvellir national park. It has the same visibility and cold water as Silfra. The diffrence is that this fissures starts inland and continous opening up on the bottom of the lake. In the part of this fissures that is on the bottom of the lake there is a halocline between the cold clear water and the warmer murkier water of the lake. Garður is an ocean dive site close to a pier at the end of Reykjanes penisular. This site is popular as you are sure to see fishes there all year around. 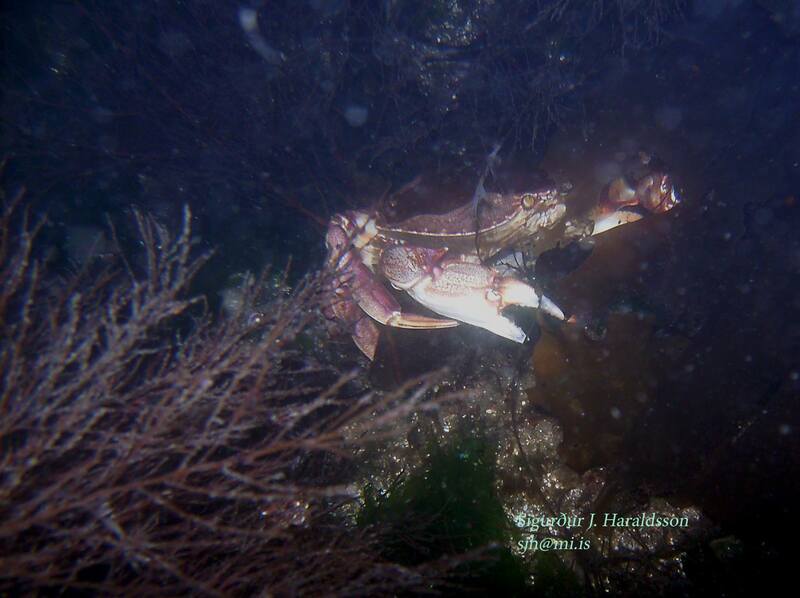 Maximun depth is 16 meters out on the sand but must fishes and liveform is around the pier and in the kelp forrest. Wolf fish, makril, monkfish, flaunders and cod are among the species that can be seen there. Flekkuvík is an ocean dive site in the middle of Reykjanes penisular. To get there you need a 4x4 and to dive the weather needs to be good. Entery and exit is on a rocky shore line and it can be a challanges to get in and out of the water. This site has a large kelp forrest and a steep slope going down to 30 meters. This site is unbelivablely beautiful in the conditions there are right. Schools of fish can be seen swimming there. 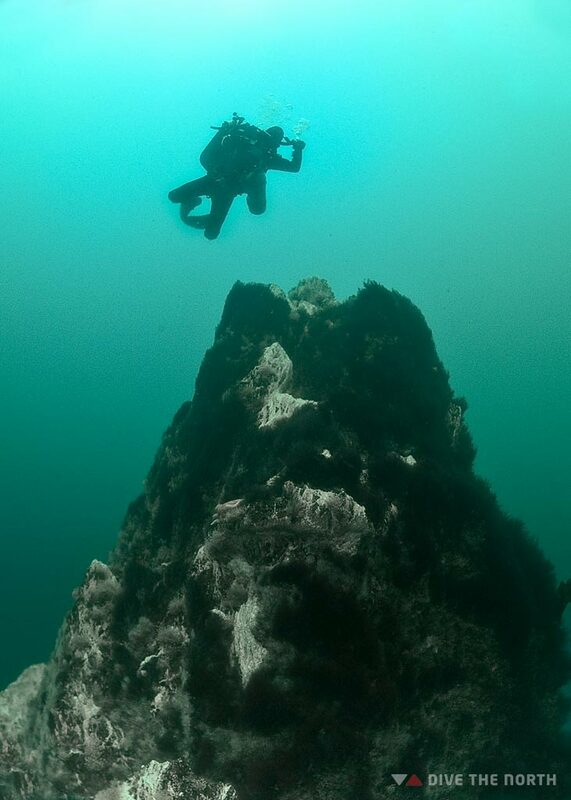 Óttarstaðir is a dive site close to the capital area. 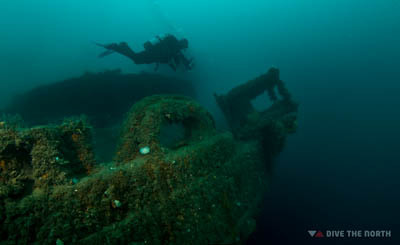 It is popular site among the local divers for training and after work diving. 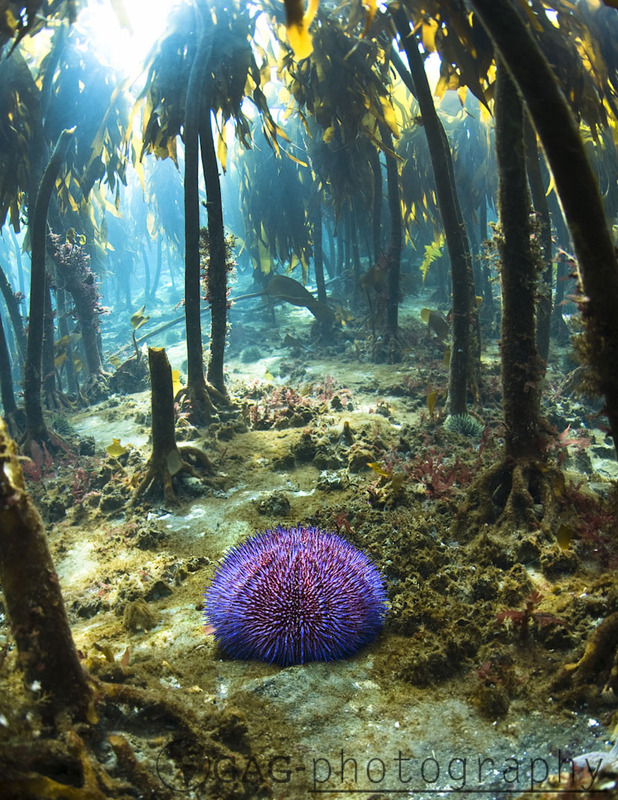 It has a large kelp forrest and plenty of live to be seen. After the kelp forrest there is a slope going down to 18 meters depth. 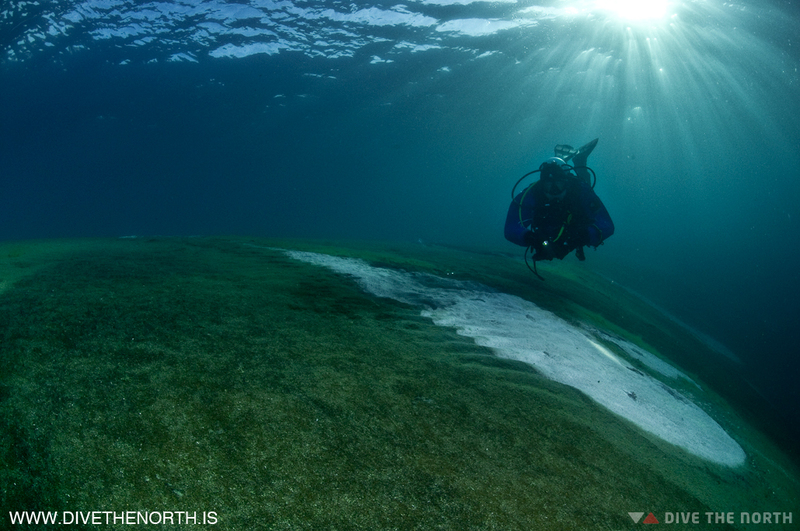 This dive site is partially sheltered by a reef. Strýtan is a geothermal chimney in the north of Iceland. This pheonoman is cause by mineral rich hot water is depositing its mineral as it cools down and builds up a chimney over few hundred of years. 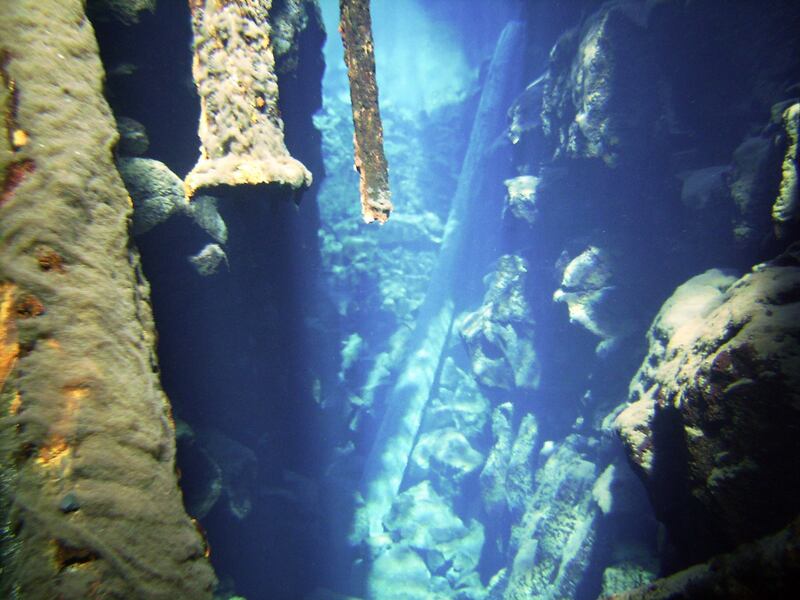 This is the only known site where people can scuba dive down on a geothermal chimney as they are usually located in few thousund meters of depth on the ocean floor. This dive site is in the north of Iceland and requires traveling there and staying over night. El Grillo is a wreck of a British oil tanker located in Seydisfjordur on the east cost of Iceland. It was sunk in WW2 after an air raid by the Luftwaffe. It was at the time a large oil tanker and is 143 meter long. It sits at the bottom at 45 meters with the top of the bridge at 22 meters. The deck is at 30 meters of depth. This dive site is in the east of Iceland and requires traveling there and staying over night.